Although they let one win slip away, South Carolina trucker, racer and team owner Roger Starrette’s RS Dragbike Motorsports team has owned the finals during a stretch that started with the Manufacturers Cup DME Summer Finals in Valdosta, continued through two MIRock Superbike Series races at Rockingham Dragway, and on to MIRock’s Orient Express Motorcycle US Nationals at Atco. 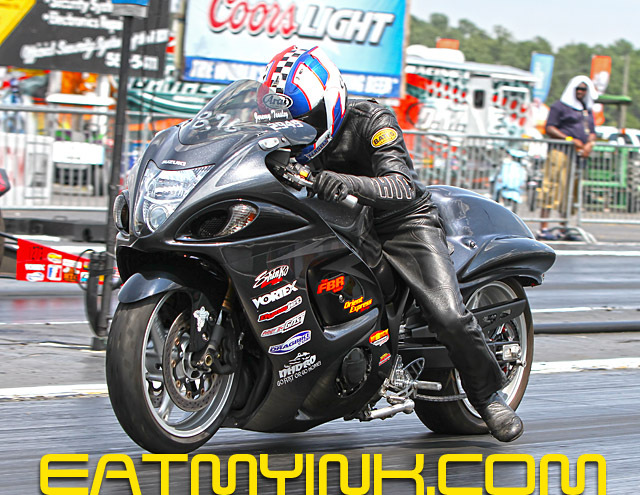 David Merks snared his first two DME Real Street wins during the stretch and added a runner-up on his turbocharged Suzuki Hayabusa. 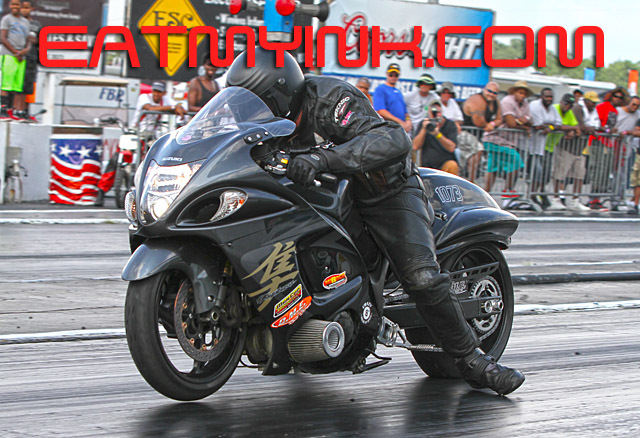 Multi-time Real Street champ Jeremy Teasley added a win and a runner-up on his nitrous-huffing, Kawasaki ZX14. Starrette himself—who hasn’t raced a bike since 2008 and never out the back door—dropped 60 pounds and jumped into the fray. He runner-upped to Merks in Valdosta. Even Teasley’s dad James “Crow” Teasley threw himself into the mix with 7 second passes. What’s unusual about the stretch is not the team’s success, but that only one win was accounted for by Jeremy. “After Rockingham, Roger took my bike to the bare frame and redid the whole bike,” said Jeremy. “It’s nothing different then what I’ve been riding, just all new electronics. It worked. 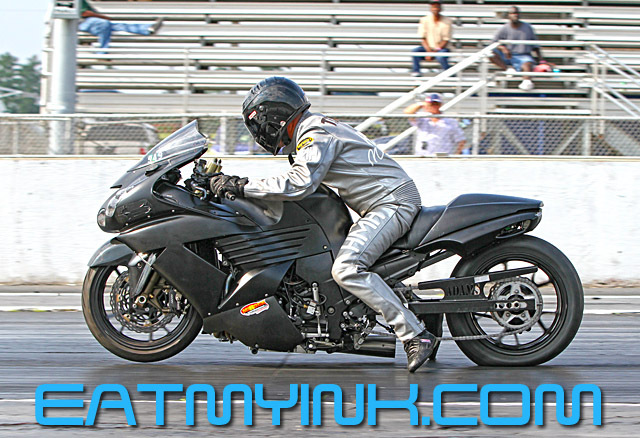 The bike stayed in the 80s all weekend and went that amazing 204.60 on the rear wheel. Making that power at 63 inches, it’s going to do that. I don’t mind if we keep putting numbers out like that. Roger Starrette himself—who hasn’t raced a bike since 2008 and never out the back door—dropped 60 pounds and jumped into the fray. He runner-upped to Merks in Valdosta. 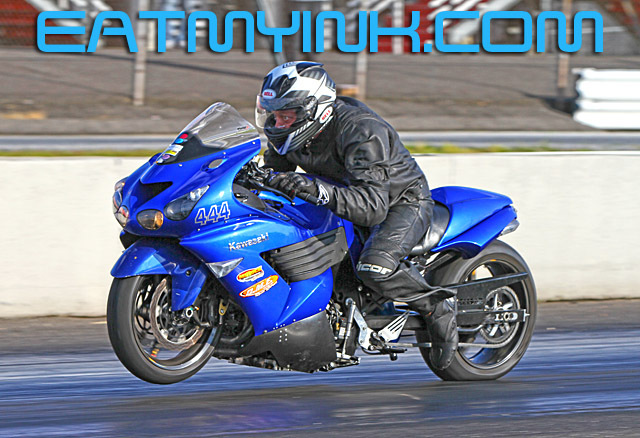 Jeremy also had a remarkable run on Carroll Craft’s ‘Busa at Rockingham. He rode the bike normally reserved for brother Cameron to the Trac King/APE Top Sportsman win and Cycle Connection Crazy 8s and FBR Shop 5.60 runner-ups. “I rode CC’s bike ‘cause I wasn’t able to bring my ZX14R,” said Jeremy. “CC’s bike was the next best thing, maybe a little better. He’s got that bike set up so nice it makes my job a lot easier. Big thanks to him for that. After Rockingham Roger Starrette took Teasley’s bike down to the bare frame. The overhaul has netted the team consistent 80s. Even Teasley’s dad James “Crow” Teasley threw himself into the mix with 7 second passes. Congratulations Roger! So happy for you. Dad had talked to Mr. Cushman and he told him about you racing! Way to go!